Liberty Bell’s Ruthann Matteson (left), Jadyn Mitchell and Hailey Damman celebrated a point during the Lady Lions’ 3-0 win over visiting Soap Lake. 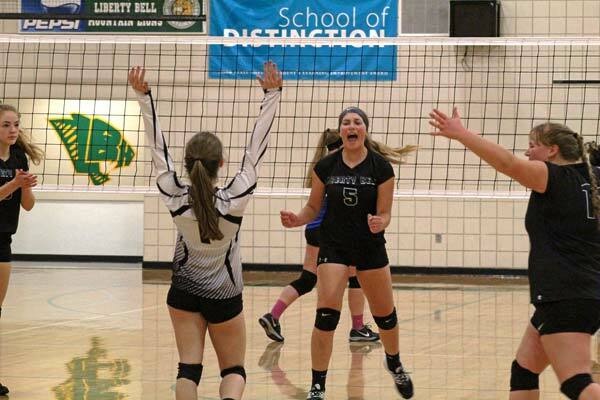 The Liberty Bell High School volleyball team has started the 2018 season with three consecutive victories, already matching their win total for all of last season. Last Thursday (Sept. 13), the Lady Lions took to their home court after 3 – 1 road wins at Oroville and Tonasket, and shut out the visiting Soap Lake Eagles in a 3 – 0 victory. Liberty Bell won the match 25 – 17, 25 – 9 and 25 – 20. The action started with an extended point to start the first game — both teams refusing to let the ball hit the floor — and it looked like it might be a long night. Soap Lake got off to an early lead before the Lady Lions turned it around. The second game was all Liberty Bell. Soap Lake made a contest of it in the final game, recovering from a 12 – 3 deficit to tie the game at 17 all. The Lady Lions steadied themselves, scored the next point and took it home from there. Although losing quite a few players to graduation, Liberty Bell returns three veteran juniors — Hailey Damman, Hannah Bakke and McKenna Ott — who steadily contributed all night. Senior libero Ruthann Matteson, a first-team all league honoree last year, anchored the middle. Joining the lineup this year is 5’–11” freshman Jadyn Mitchell, who dominated at the net on offense and defense. Freshman Shae Taylor and senior Sky Schrum also saw a lot of playing time for coach Christine Scott and assistant coach Stephanie Mitchell. The Lady Lions’ next game is at 1A Okanogan on Wednesday (Sept. 19). They travel to Lake Roosevelt on Tuesday (Sept. 25), then host Oroville on Sept. 27, with the varsity game starting at 6:30 p.m.